Planetary Visions has more than twenty years' experience in the production of computer graphics showing Earth's landscapes and physical processes. Our specialised software, developed in-house, is optimised for the efficient rendering of large digital terrain models and overlaid satellite images. Our terrain renderer also offers atmospheric effects such as fog, haze and cloud layers, as well as interlace, time-sequence and motion-blur rendering. Our ray-tracer was developed to model the visual effects of varying-density atmospheric layers, terrain and cloud shadowing. By combining these tools, we can produce clear, accurate portrayals of our world and the way it works, combining art and science to stunning effect. 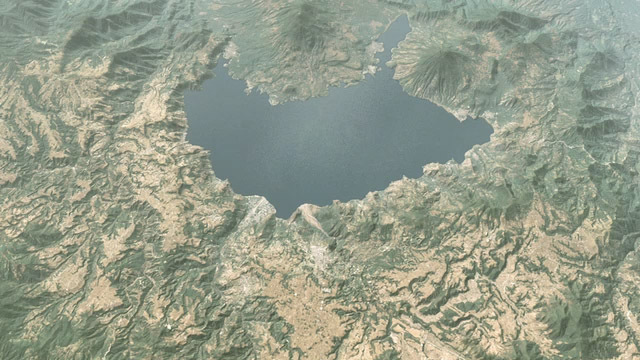 Lake Atitlan, Guatamala, based on Landsat 7 ETM+ imagery and SRTM digital terrain, from the documentary film 'Mayan Blue' for Standoff Studios.